Whenever I see the name babelfishh, I am immediately taken to the name Badfish, which is not only a better Sublime tribute band than that joke out there with Rome or whatever his name is, but it is also a song by Sublime, and since I then begin singing that in my head, I feel like I’m off on a good foot with babelfishh before I ever press play on this cassette. 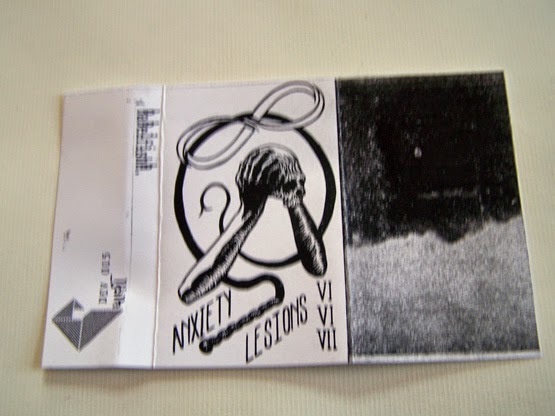 Likewise, when I see this cassette title I always think it says “Anxiety Lessons” and have typed it as such more than once, but I digress. The sound of babelfishh couldn’t be further from the slow paced, acoustic sound of the Sublime song that the name reminds me of almost always. 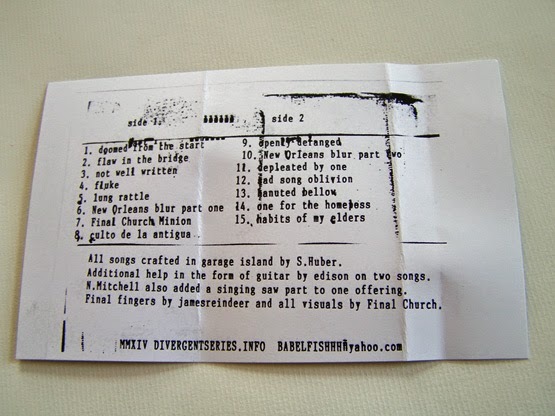 Along with some audio clips, babelfishh is a collection of thrash, chaos and… rap? Yes, rap. You know how good music can take you to a story? Well, even better music comes on cassette and can take you to stories about cassettes. Years upon years ago, a friend of a friend decided to set me up with his ex-girlfriend because clearly she was his ex for a reason, so why not dump the insanity on me? His claim was that she liked Korn, Limp Bizkit and all of those types of bands which I supposedly liked according to him because I wasn’t into Top 40 radio. Whatever. So she got me into this band, or hip hop group of sorts, called Kotton Mouth Kings. I liked them at the time, but am not sure if I would still as much if I put them on today. This story is going to two places and I’ll hurry along to both of them. First, I don’t know if I’d like Kotton Mouth Kings now because of the style of the music that came with them, their lyrical content, etc., but I was always a fan of their delivery in the lyrics, as they seemingly made every day events turn into moments of triumph. 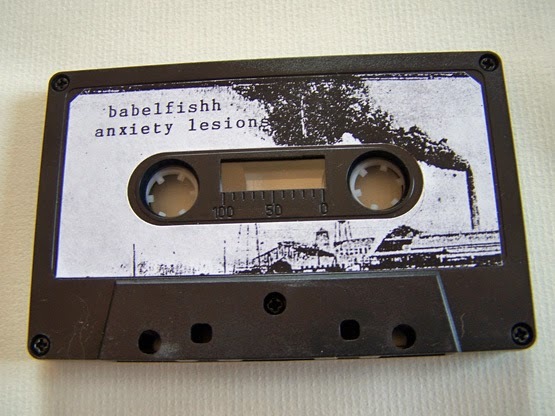 I can still respect that about them, and that is the quality I hear coming out in this babelfishh tape. 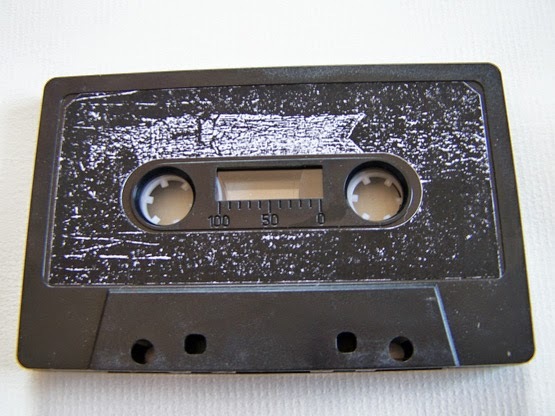 Also, I had a car back then with a tape deck, so my then girlfriend made a copy of the CD onto tape for Kotton Mouth Kings, thus I remember listening to it a lot on cassette. See how everything sort of comes full circle with good storytelling? What else needs to be said about this cassette is throughout the points of rapping, there is also some pretty heavy distortion that brings out the likes of other artists I enjoy such as Bloody Knives and Dana Fowler And The. While it seems like that might not look so good paper, such as some form of a lighter Limp Bizkit or a band from that genre at least (I’m sure someone would be an example, like hed(PE) or what not), I can assure that this doesn’t really sound like that, but rather comes off much more crafted, much closer to noise and just all around better. If you told me ten years ago—hell, if you told me ten days ago—that Adidas Rock could be improved upon, I would have laughed in your face. But now, I am a believer, though I would much rather have this simply be called thrash rap.